Dan appeared on Good Morning America this morning to discuss the Zimmerman defense’s choice to rest its case after George Zimmerman revealed his decision to not testify. 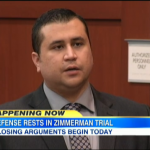 Today, we will hear closing statements for the Zimmerman Trial and then on Friday, the case goes to the jury. Dan says, “I think the aggravated assault is absolutely crucial. I think the jury will hear the possibility of manslaughter. If they hear the possibility of aggravated assault, the reason it makes the defense nervous, is, ‘A,’ it provides the jury with a compromise. And, ‘B,’ under Florida law, he could end up serving more time for aggravated assault with the use of a firearm, because he had a firearm with him, than would be the case with simply manslaughter. So, there are a lot of reasons for the defense to be very nervous about that aggravated assault lesser included offense.” Watch the segment here.